Chemo is Scheduled… as is Barfing. First thing, I’m off to the dentist to get some fillings repaired before the chemo starts. My dentist recommends a saliva replacement that I might use in case I get a dry mouth because of the drugs. So, I’m hanging out exploring our new digital TV service. Cass drops in for lunch and then heads back to work. Hmmm. So, I’m sitting there and I start thinking. I’m on vacation. I have cancer. What the heck, I’m having a whiskey. And another. And some chocolate. Aaaaaaaaa. Much better. I’m still waiting for a call back from BCCA. Both Cass and I are anxious because we do not have anything booked. No appointments with the doctor, chemo or further tests. Oh, they just called. 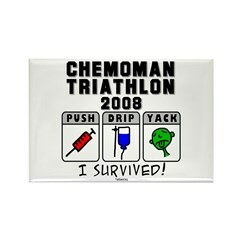 My first chemo cycle begins on Wednesday morning, July 9th. It’s starting. They are going to call back with some prescriptions that I need to have with me when I go. These are anti-nausea drugs since this is an excruciatingly common side effect of chemotherapy. Dexamethasone which is a corticosteriod which decreases the body’s defensive responses, barfing being one of them. Prochlorperazine affects the neurotransmitters to reduce the urge to vomit. Ratio-Ondansetron (aka Zofran). This one’s da bomb. It’s specifically designed for chemotherapy patients. One tablet costs ten dollars. Thank goodness for our supplemental health plan. Tonight we’re off for dinner with our friends Gord and Janet. We’ll be eating at one of our favourite restaurants in town: Camille’s. They make the most fantastic prawn bisque. I intend to make the most of my appetite while I’m still able to stomach it.